Greetings! I hope that you and your families are enjoying the summer. In this month’s edition of Holsten Galleries News I have gathered together some wonderful new works by several of the artists I represent. I hope you enjoy viewing the work and I look forward to hearing your comments and questions. "I can’t understand it when people say they do not like a particular color. How on earth can you not like a color?" Stromboli, 35" x 8" x 4"
The Maestro has revisited here one of his previous series, Stromboli, named after the famous Italian volcano. Lino has captured in this piece the fire and intensity of a volcanic eruption. I love the soothing, cool blue cane work on the interior shown in the detail shot above. 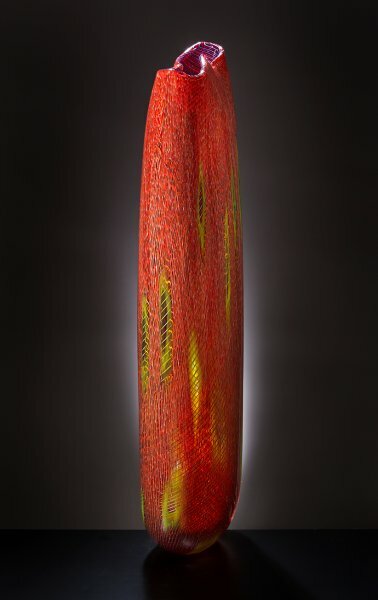 I think that nearly everyone who knows anything about contemporary glass art recognizes the name Dale Chihuly. 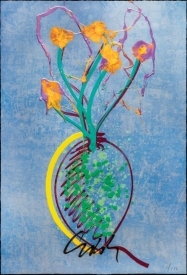 But not everyone realizes that Chihuly is also very accomplished with work on paper. In addition to Dale’s acrylic paintings (or Drawings, as he calls/refers to them) he also creates beautiful prints. 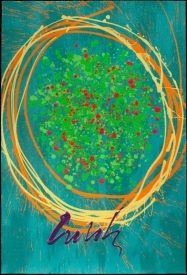 This month I decided to feature two of my favorite Chihuly lithographs. In each of them we can see a reference to his blown glass forms. 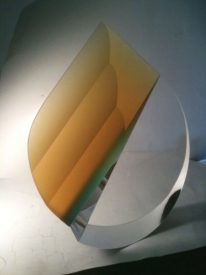 This new piece by Michael Taylor is an excellent example of his glass sculpture. The touches of primary colors in this predominantly clear piece add focus and drama to the flowing form which is comprised of various geometric shapes. 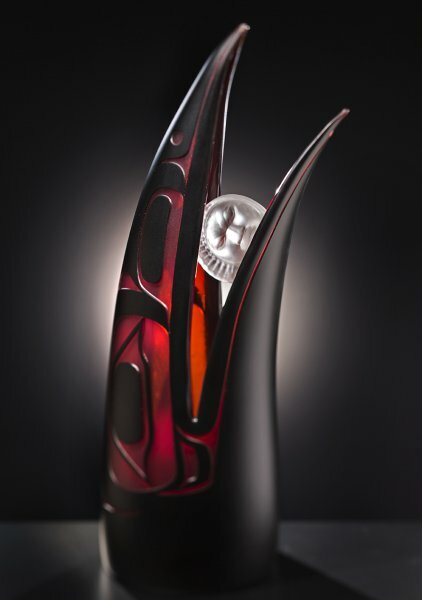 This new iteration of Preston Singletary’s well known Raven Steals the Moon series is a stellar piece. The contrasting red and black colors are dramatic and the carving, particularly on the face of the moon, is outstanding. 19.75" x 6" x 7"
Hole in One, 6.3" x 6.3" x 6.3"
This latest piece by Wesley Neal Rasko is yet another example of artistic sensibility combined with impeccable craftsmanship. The layering creates a rich inner landscape and the tilt of the piece adds great interest as well. Understated as it is, this piece is quite impactful in its own quiet way. 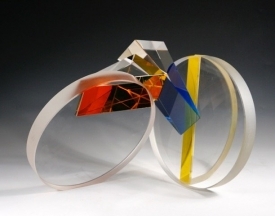 Crosscut Halo is one of my favorite ever works by Seattle glass artist John Kiley. Both the form and the palette of colors are superb. 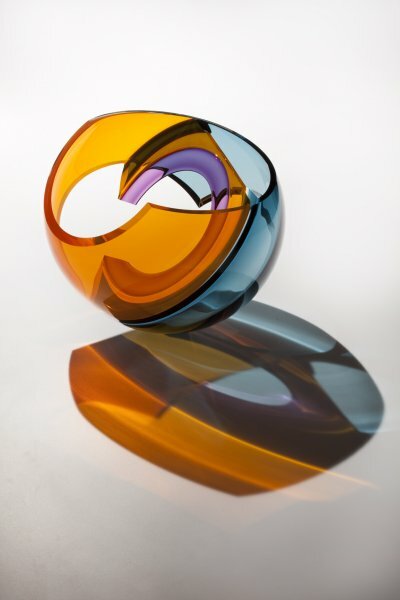 I particularly like the interrupted band of purple glass which adds a dynamic tension to this piece, leaving us with a feeling of wanting to bring the two ends together to close the gap. 12" x 14.5" x 14"
This is the first new piece by Martin Rosol that I have been able to feature for quite some time. 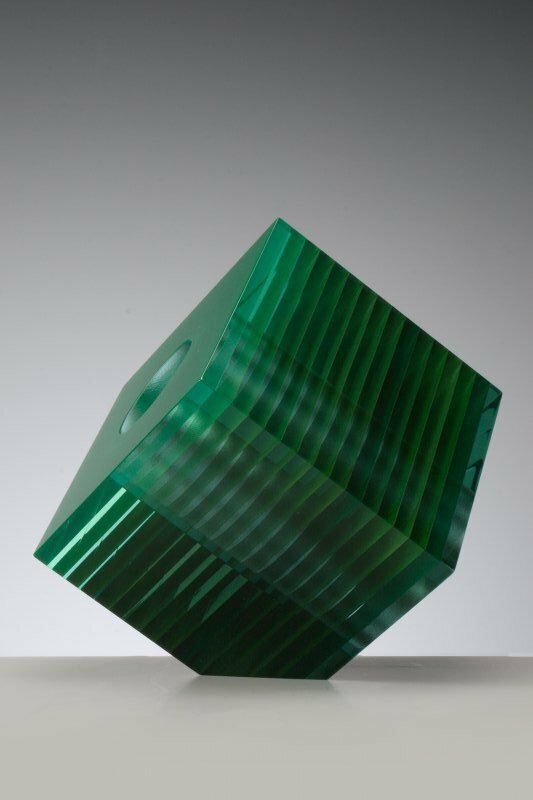 Martin’s glass sculpture has evolved so much over the 25 years that I have represented him. I would characterize this piece as elegant, sophisticated and a bit mysterious. Thank you for taking time to share some beautiful pieces of art. Enjoy your summer, be well and stay in touch.